NOVO-OGARYOVO, Russia -- Ukrainian Prime Minister Mykola Azarov, seeking to revise a gas contract with Russia, called for the two sides to forget the legacy of Ukraine's previous government during talks Thursday with Prime Minister Vladimir Putin. Putin welcoming his Ukrainian counterpart, Azarov, before a meeting Thursday at his Novo-Ogaryovo residence. “Perhaps, we must forget what happened between our countries over the past five years, turn the page and start our relations from a clean slate,” Azarov said in his opening remarks. He was referring to the five-year presidency of Viktor Yushchenko, during whose tenure relations between the two countries were tested by several gas wars and other political feuds. The current government, under President Viktor Yanukovych, who ousted Yushchenko in February elections, wants to repair the rift between the two neighbors as part of an effort to steer the economy out of its nosedive, Azarov said. “We will do everything to rebuild our cooperation and our joint projects,” he said. Azarov said he brought new proposals for Russia, possibly referring to a plan that would see operational control over Ukraine's giant gas pipeline network handed over to a consortium including Ukrainian energy firm Naftogaz, Russia's Gazprom and European Union energy firms. Ukrainian officials, including Yanukovych, have repeatedly floated the idea in past weeks. Even so, Azarov didn't even mention gas during his introductory speech. “We may … reach some agreements soon; sign them and show that we don't simply exchange proposals but work constructively,” he said. 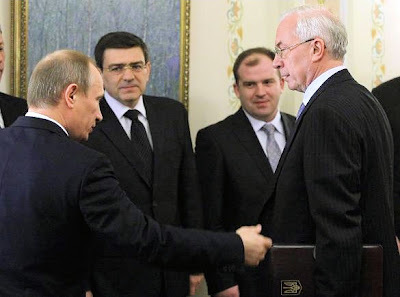 Putin, receiving his counterpart in the Novo-Ogaryovo residence outside Moscow, was quick to note that this was Azarov's first foreign trip as prime minister. “It's very pleasant. It's a good sign,” he said, before lamenting that the trade between the countries had decreased over the past few years. It is possible, he said, to restore previous trade levels or even raise them to new heights. Afterward, the talks were continued behind closed doors and were still ongoing Thursday evening. Ukraine's new government believes that the current gas trade contract is charging an unfairly high price on imports from Russia. Earlier Thursday, Gazprom urged Ukraine to store up enough gas during the summer to ensure smooth westward transit during the winter, the company said in a statement after its chief Alexei Miller met Azarov. About 80 percent of Gazprom's exports to Europe traverse Ukraine. Opposition parties in Kiev promised a tough fight over the gas consortium plan, describing it as harmful to national security. A Ukrainian opposition lawmaker said there would be riots if the government handed some of the authority over the country's pipelines to Gazprom. “If the government attempts to trade away Ukraine's independence, sovereignty and national interests, including strategic national assets, our people will be strong enough … to stand up for everything Ukrainian,” said Ostap Semerak, a senior member of the Yulia Tymoshenko Bloc, named after its chief, the former prime minister.